On May 2nd, at 10 a.m., students from over 300 schools in over 40 states will walk out of classrooms for 16 minutes in support of gun rights. Primary organizer Will Riley says, “The media’s depiction of my generation as anti-Second Amendment is nothing less than lying by omission. There are two sides to every story, and the mainstream media is trying hard to make sure only one is heard.” Will is a senior at Carlsbad High School in Carlsbad, New Mexico. On May 2 at 10 a.m. for 16 minutes, pro-Second Amendment students will walkout. Riley pressured his school to accept the walkout because students who left school on March 14 to protest gun violence were excused. Many schools around the nation allowed students to walkout during the National Student Walkout, while some said students who left would face disciplinary action. In the article, Riley points out that March for Our Lives had financial support from celebrities and national anti-gun organizations. Stand for the Second is a student-organized, student-led protest without any high-profile support. The Tea Party Patriots have helped Riley by dedicating a part of its website to making it easy for students to sign up and print out protest signs. 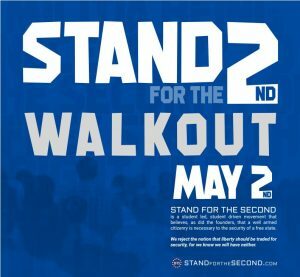 Click here to participate in tomorrow’s Stand for the Second walkout. The national media gave the March for Our Lives a lot of coverage and positive attention. Are you surprised its pretty much ignoring Stand for the Second? Gun Love is asking you to share this post with everyone you know, so we can raise awareness in support of these brave, pro-gun, pro-Second Amendment young men and women. So glad some students are not being influenced by the evil demonrats!! We need to stand up for the 2nd amendment! !